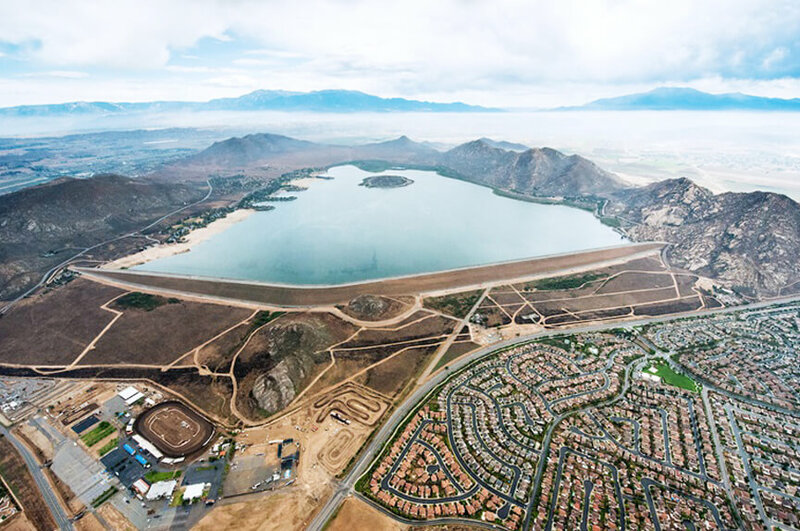 Built in 1973, Perris Dam was classified as a high-priority Dam during California Department of Water Resources’ (CA DWR) statewide assessment identifying Dams in need of structural upgrades. As part of this assessment, it was determined that Perris Dam required seismic retrofits and Cement Deep Soil Mixing (CDSM) reinforcement work. In general the statewide initiative analyzed dams for structural integrity, specifically dams near fault lines. Perris Dam was determined to have a failure zone that was at risk during a seismic event. Terracon was awarded a contract to work with California DWR to complete construction of the seismic retrofit in 2017 through 2018. Condition monitoring of the dam and surrounding foundation was paramount during the seismic retrofit project. As such, Terracon and California DWR selected sensemetrics’ monitoring platform for all data management. Specifically, sensemetrics’ wireless edge devices (THREADs) were used to identify changing groundwater pore pressures related to CDSM reinforcement work. sensemetrics was selected because of its plug-and play support of existing and new geotechnical sensors and ease of installation – greatly reducing installation timeline and costs. The sensemetrics platform consisted of on-site telemetry and integrated CLOUD data management which integrated a combination of existing on-site sensors (inclinometers, piezometers, weather stations), as well as provided for installation of a new and enhanced monitoring program. The installed system provided automated reading of a number of onsite open standpipe observation wells, using low-power Geokon GeoNet devices enabled with vibrating wire interfaces, with Geokon vibrating wire piezometers. A Vaisala weather station was also installed, to provide real-time barometric pressure compensation of piezometer data as well as atmospheric information. End users from Terracon and California DWR are able to log into sensemetrics’ CLOUD based platform remotely from any web browser, enabling easy and seamless real-time access to new sensor data as well as historic data. As a result of using sensemetrics’ CLOUD based platform for real-time condition monitoring and sensor data management, California DWR, Terracon, and other State & Federal agencies now have shared access to streaming data. Additionally, California DWR has experienced several thousands of dollars of cost reduction for each sensor station. With over sixty (60) stations around the Perris Dam site, total cost reduction is substantial.